Philippine's Latest Entertainment News: Andi Eigenmann finally named the father of her unborn child. Andi Eigenmann finally named the father of her unborn child. At first Andi refused to openly name him. But now, months after news of her pregnancy spread, she has completely named the father of her unborn child. 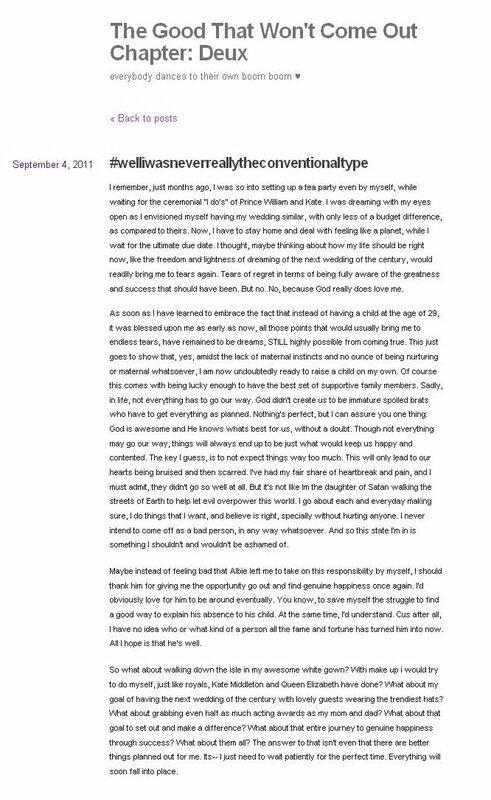 "Maybe instead of feeling bad that Albie (Casiño) left me to take on this responsibility by myself, I should thank him for giving me the opportunity (to) go out and find genuine happiness once again," Andi said in her post "#welliwasneverreallytheconventionaltype" on Sunday, September 4 in her blog "The Good That Won't Come Out Chapter: Deux" at andieigengirl.posterous.com. Andi stressed out that while she is not anticipating for Albie to take on the responsibility, she hoped he will grasp his role in due course. "I'd obviously love for him to be around eventually. You know, to save myself the struggle to find a good way to explain his absence to his child. At the same time, I'd understand. Cus after all, I have no idea who or what kind of a person all the fame and fortune has turned him into now. All I hope is that he's well," Andi posted. credits: photo from Yahoo! OMG!